Run Time: 147minRated: PG (Canada) PG-13 (MPAA) for extended sequences of violence, action and mayhem. Captain America: Civil War, is MARVEL Studio's third film featuring Captain America not including his appearances in films like Avengers Assemble (2012) and Avengers: Age of Ultron (2015), and a couple small cameos in other MARVEL films. As a result, Steve Rogers/Captain America (Chris Evans), along with many of the other recurring MARVEL superhero characters like Tony Stark/Iron Man (Robert Downey Jr.), have received enough screen time to start developing into robust and complex characters. This current film provides fertile ground for this growing maturity in a genre not always equated with depth of character development. At its heart this is a film about control and responsibility. Acting primarily as a sequel to Captain America: The Winter Soldier (2014) it picks up following the concluding events of Avengers: Age of Ultron. In that film the battle of Sokovia saved humanity from the artificial intelligence Ultron (originally built and conceived by Tony Stark) and an eastern European city was destroyed. The result of the devastation sees 117 countries propose a document called the Sokovia Accords which they ask the Avengers to sign. The request causes a split in the group’s solidarity. After showing them footage of the devastating aftermath of their world-saving heroics, Secretary of State Thaddeus Ross (William Hurt) says to the Avengers, "In the past four years you've operated with unlimited power and no supervision. That's an arrangement the governments of the world can no longer tolerate ... The Sokovia Accords ... states that the Avengers shall no longer be a private organization. Instead, they'll operate under the supervision of the United Nations Panel only ‘when’ and ‘if’ that Panel deems it necessary." 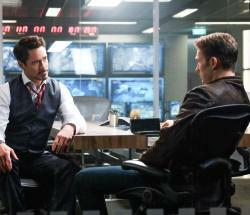 Steve Rogers refuses to sign the document while Tony Stark supports and signs it. 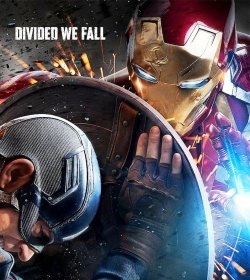 This creates a civil war within the Avengers and the various super heroes pick sides, some following Rogers others following Stark. 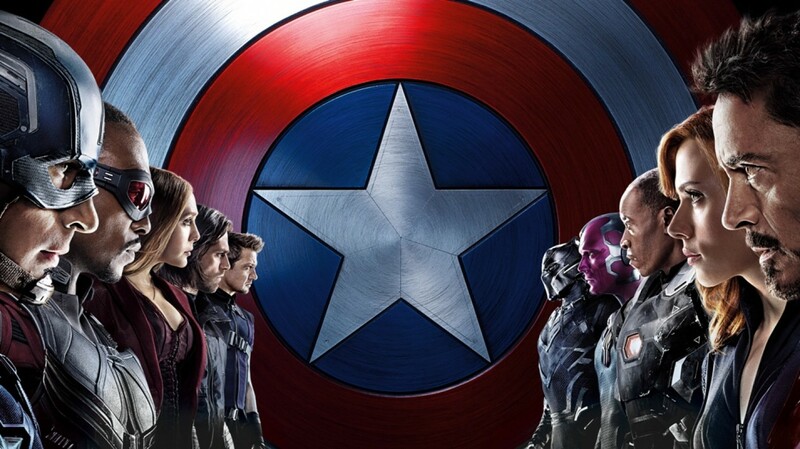 Meanwhile, in the background an opportunistic villain, Zemo (Daniel Brühl), patiently conspires to further pit the Avengers against each other using as leverage the rather tragic character Bucky Barnes/the Winter Soldier (Sebastian Stan) a childhood friend of Rogers. Barnes, who had fought in WWII with Rogers and who was presumed dead in Captain America: The First Avenger (2011), was revealed to be a mind-controlled super soldier in Captain America: The Winter Soldier. Desperate to hold on to any of the remaining bits and pieces of his own past Rogers desires to redeem Barnes believing the man he once knew still hides somewhere within the man who carried out lethal acts of espionage as an agent of the villainous organization Hydra. Knowing that Rogers’ love for his friend could be pitted against Stark’s rage upon the revelation that one of the Winter Soldier's Hydra missions directly impacted Stark’s family, Zimo sets the stage for an epic and very personal confrontation between Captain America and Iron Man. The nature of this confrontation means the film ends with no clear winner and the complexity of the story presents a film where a clear-cut hero is hard to find. On the one hand, there are the Avengers who follow the Sokovia Accords believing the world is best served if they put themselves in the hands of a governing authority, and on the other hand there are the Avengers who operate in secret because they believe, as Rogers says, "I know we're not perfect, but the safest hands are still our own." Interestingly, Rogers is trying to save Stark and the rest of the Avengers from the potential of becoming the very thing his friend Bucky Barnes had become: an instrument of the agendas of others. What if that U.N. panel becomes compromised? What if they compel the Avengers to act unjustly or force them not to act at all because of politics? What then? What if the Avengers become an instrument of evil instead of a force for justice? Christian viewers will want to consider a short exchange between Barnes and Rogers where Rogers acknowledges the effects of the mind control over Barnes’ actions as Hydra's Winter Soldier. Captain America says something like, "Those things you did, it wasn't your fault, it wasn't you who did those things," to which Barnes replies, "I know. But I still did them." Barnes acknowledges he still has responsibility for his actions, that ultimately he is accountable, he remembers it all. Barnes is a repentant character who wants to be rid of his past actions as an assassin and agent of Hydra but he also knows he doesn't deserve to be let off the hook. For Lutheran viewers think of these familiar words, "I a poor, miserable sinner, confess to You all my sins and iniquities with which I have ever offended You and justly deserved Your punishment now and forever. But I am heartily sorry for them and sincerely repent of them." Nothing would have been more satisfying than Rogers saying to Barnes, "Bucky, Jesus died for those sins; He died for all of your sins; you are forgiven." The audience doesn't get that moment, however generally speaking Roger's attitude towards his friend is one of grace and forgiveness when the rest of the world wants condemnation and retribution. Rogers is willing to put his life on the line to save the life of his friend and ultimately to save the lives of all the Avengers. Is it all serious? No. There are plenty of light-hearted moments and pure comic book fun. 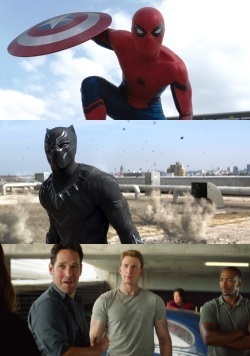 The introduction of two MARVEL characters who have not previously appeared in MARVEL Studio films, Peter Parker/Spider-Man (Tom Holland) and T'Challa/Black Panther (Chadwick Boseman), were spot-on giving some of the film’s most memorable and enjoyable moments. Also, the return of Scott Lang/Ant-Man (Paul Rudd) provided additional comic relief and for such a small character he was given one of the biggest moments in the film. All of this is balanced with a number of genuine action movie sequences on par with the kind of action viewers would find in the Bourne Identity or Mission Impossible franchises. Anthony and Joe Russo, who also directed Captain America: The Winter Solider, give their audience some real heart-pounding action which will be too intense for younger and/or more sensitive viewers. With an increasing number of super hero movies released each year by both MARVEL Studios and now DC Entertainment (Batman v. Superman: Dawn of Justice) it is encouraging to see screen writers and film makers addressing some of the more complex ideas kicking around in their comic book source material. As these films build on each other, the theme of responsibility is emerging in a way that makes them more than just a showcase for splashy explosions and ingenious special effects. While it might be hard for some viewers to keep up with the ever-growing cast of characters and subplots, MARVEL has been working hard to avoid painting itself into a continuity corner. When it comes to managing a large ensemble cast of characters Captain America: Civil War is not as successful as Joss Whedon's Avengers Assemble and Avengers: Age of Ultron however it still provides a satisfying film that fits well into MARVEL's growing meta narrative.